We spent this last weekend exploring the countryside, and went to a beautiful apple orchard. Meaning we have bags upon bags of apples and are now making every apple recipe known to man. 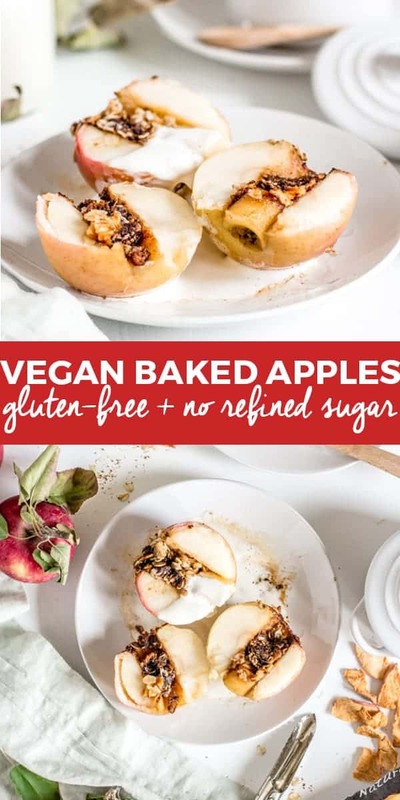 Naturally, I needed to make these super delicious and easy vegan baked apples. A few weeks ago, I mentioned on my Instagram that I am slowly transitioning into a more plant-based diet. 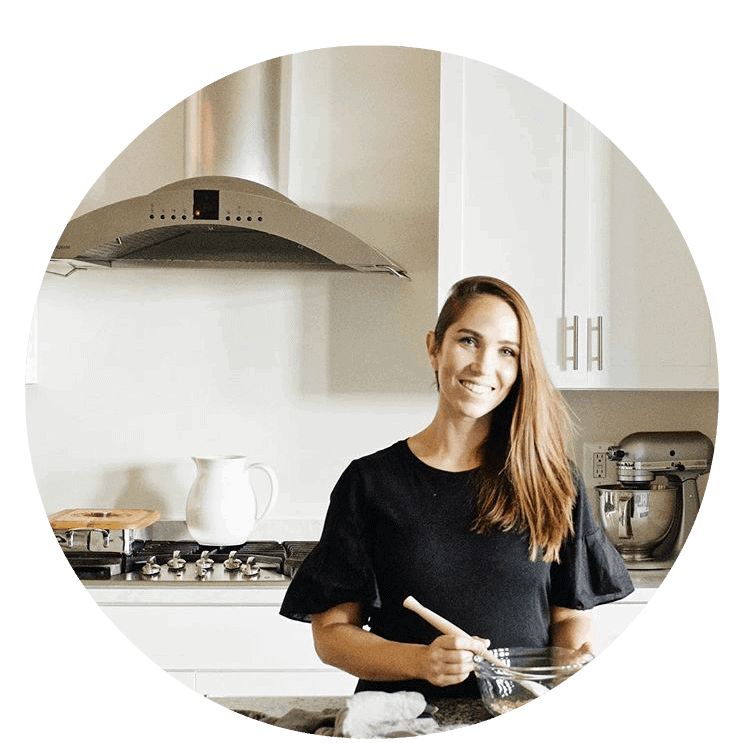 So, I am sharing with you the healthier versions of favorite holiday recipes. 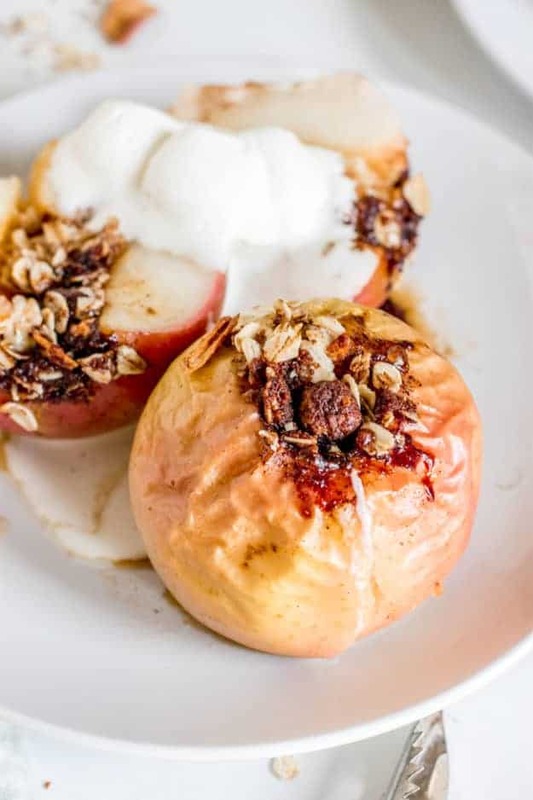 Gluten-Free and Healthy Baked Apples with No Refined Sugars! 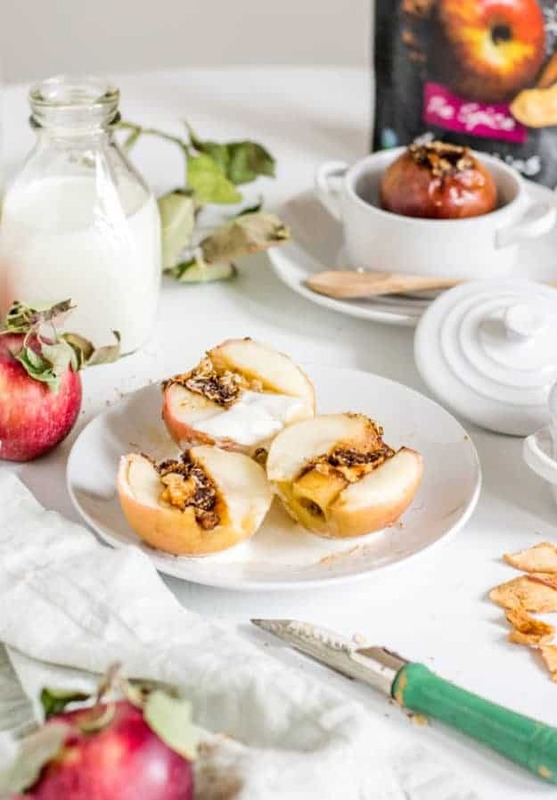 You can buy the Bare Snack apple chips at your grocery store, and check out all of their other flavors on their website here. 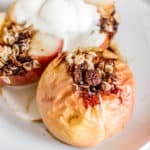 Now, make sure you pin this baked apple recipe and make it for dessert on a chilly weekend, or save it for Thanksgiving! Grab the recipe below and enjoy! 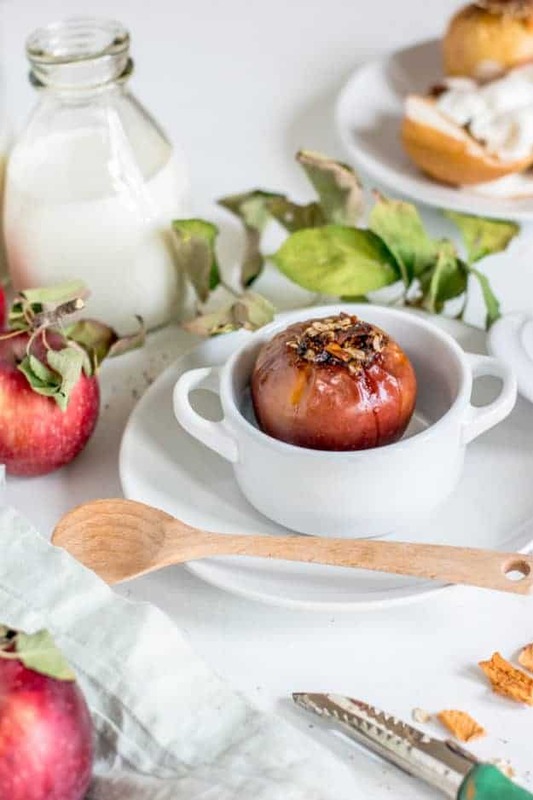 Make these easy vegan baked apples for a healthy seasonal treat! In a small bowl, mix together oats, sugar, cinnamon, cloves, nutmeg, salt, Bare Snacks Pie Spice chips, and vanilla extract. Set aside. 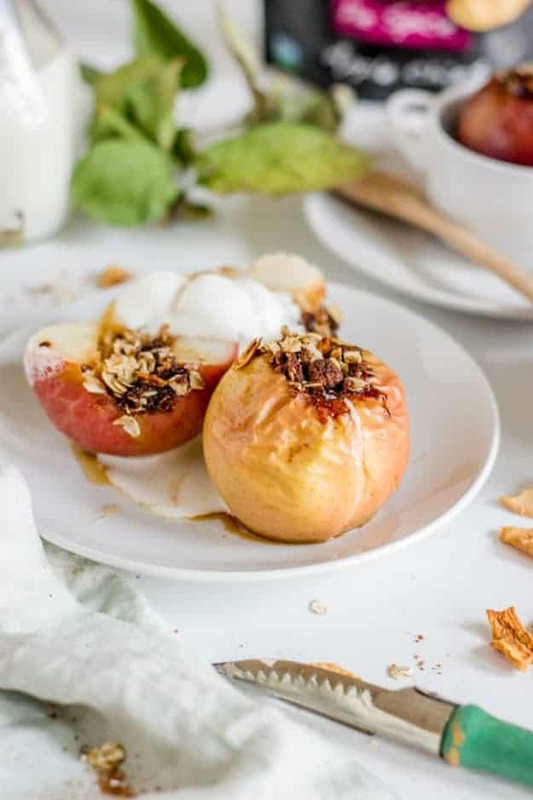 Use an apple core utensil to remove cores from apples. Place in a square baking dish. Tightly pack filling into each apple core. Pour one cup of water into the bottom of the dish. Loosely cover dish with foil, and bake on 375°F for 20 minutes. Remove foil. 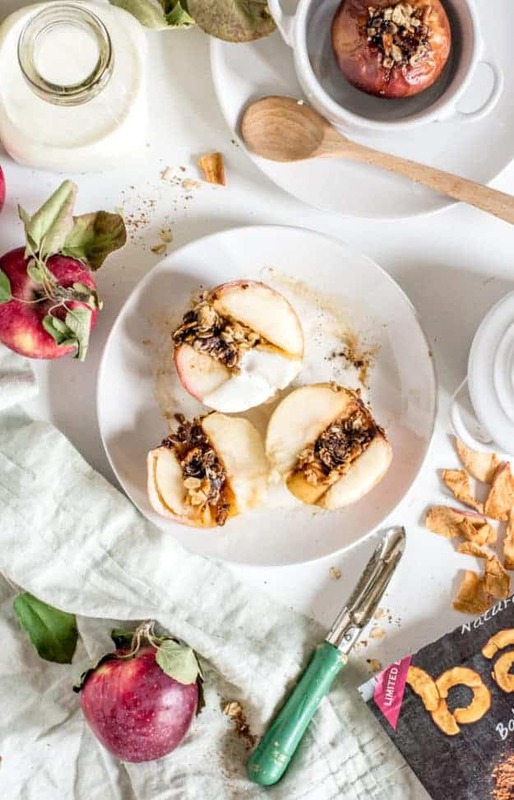 Add 1/2 tablespoon coconut oil to the top of each apple. Bake for another 25 minutes until apples are soft, and filling is bubbling. Serve while warm with coconut cream if desired. Enjoy! This post was created in partnership with Bare Snacks.